Within the mobile gaming sphere, “tower defence” is a massively oversubscribed genre. It’s the type of game that is easily adaptable to touch-screen devices and, as a result, the App Store is bursting to the seams with towers that need defending. So to stand out from all the other similar games out there, developers need to offer something different in either presentation or gameplay. Steampunk Tower manages a little of both. It adopts the Steampunk aesthetics that are becoming increasingly popular these days, while also giving you just one tower to defend – but that doesn’t mean you won’t need quick reflexes and fast fingers to ensure your masterpiece of steampunk architecture doesn’t become a pile of exquisite rubble. Within your tower are various slots where turrets of different kinds can be placed, each one useful (or not so useful) at repelling a particular type of enemy unit. Enemy forces will attack from the left or right in waves, while your turrets will automatically fire when within range of the aggressors. However, each of your turrets has a finite amount of ammunition – once depleted, you must manually reload by dragging your turret to your tower’s central shaft (ideally, in-between enemy waves). It’s this plate-spinning element that is central to gameplay, as you need to ensure your turrets don’t run out of bullets during particularly long waves. You can shift the location of your turrets around as well, which is useful when you want your more powerful units attacking a certain side, and the whole procedure is like playing one of those sliding tile puzzles. It’s a process that’s much easier on an iPad – on an iPhone, I found moving turrets around to be quite tricky due to their decreased size. A successful defence will reward you with money and other elements, with money being used to purchase upgrades for both your tower and turrets. Once the upgrades are purchased, towers can be levelled up mid-battle by dragging them to the bottom of your castle and purchasing the new unit with a different form of currency (earned by killing enemies in battle). 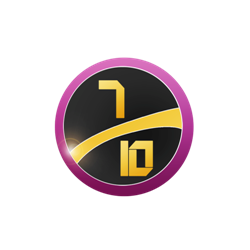 An element known as Etherium is used to power one of three extra powerful attacks (the powerful eye-laser beam, a lightning wave that stuns and damages enemies, and a deadly airstrike that levels all enemies in its path) and is earned by finishing certain levels, or via in-app purchases. Luckily, you can progress without ever having to spend more than the initial outlay; neither does it prompt you or remind you that you can spend money on Etherium and in-game money. The option is there of course, but it’s clear that you won’t need to resort to opening your wallet to further your time with the game. If you need more resources, you can just replay finished levels. 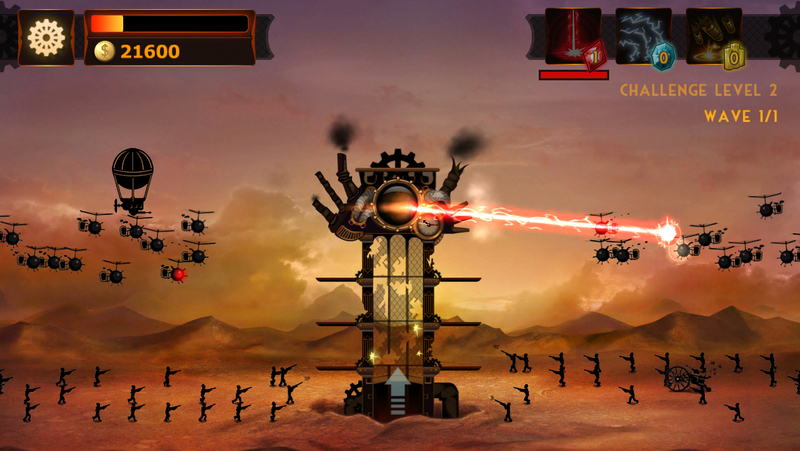 This is certainly a different kind of tower defence game, although Steampunk Tower’s biggest problem is monotony. There isn’t quite enough depth to carry the game through more than 10 levels or so, as the only change in gameplay is that your turrets get better upgrades and your enemies become tougher and greater in number. Some of the Challenge levels fare a little better, as you are given restrictions on the type of units and abilities you are allowed to use. Even visually, nothing really changes. The steampunk visuals are great, but each level is set on the exact same battlefield and it just gives you a sense of deja vu way too early in the game. The music is pretty decent though, with a few classy jazz tracks and some suitable battle music. 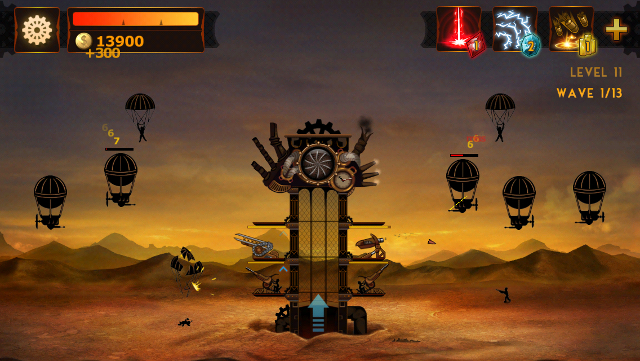 VERDICT: With so many Tower Defence games out there, Steampunk Tower starts with a great idea that works well for the most part, and it’s hard to fault the basic gameplay. It’s well-presented and nicely polished, with nothing intrusive when it comes to in-app purchases. Sadly, variety is the main aspect that stops it from being a great game instead of simply a better-than-average one. There’s little to stop you feeling that you aren’t playing the same battle over and over again, while levels are less about strategy and more about how quickly you can move your most powerful artillery to where it’s needed.